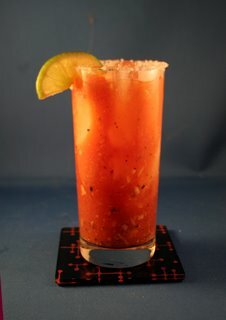 Bloody Mary type recipes are endless, and bars that specialize in them have sprung up in cosmopolitan cities and beyond. At some of these bars, you make them yourself. Many of us have our own favorite techniques and ingredients. My favorite is the one pictured above. Called Angry Red Planet, it has a bit of an Asian flair and comes from Karen Brooks, Gideon Bosker, and Reed Darmon's Atomic Cocktails: Chronicle Books, San Francisco, 1998. I like to think of this book as having helped to move the cocktail craze forward in a back to the future way. Because of the glass we used, I doubled the amounts of all ingredients as called for in the book. Salt the rim of a highball glass by first rubbing with cut citrus, then turning the glass upside down into enough kosher salt to coat it. Chill the glass. Combine the ginger, horseradish, garlic, soy sauce, lemon juice, and cracked pepper in a bowl and muddle into a paste (it may be a little lumpy.) Stir in the vodka. Pour the mixture into a large mixing glass along with the tomato juice and the lime juice. Fill the chilled glass with ice and add the vodka mixture. Garnish with the lime wedge. If desired, stick a chopstick in the glass to use as a stirring rod.